Rachel Eddy hails from West Virginia, where she grew up steeped in Appalachian music and dance. Rachel’s multi-instrumental talents and soulful singing bring an incredibly powerful energy to the group. In addition to her work with Ken and Brad, Rachel performs as a soloist and tours with The Early Mays. Rachel was born and raised in rural WV just south of Morgantown, where her musical family inspired her to play and sing as a little girl. She grew up listening to local fiddlers, her father among them, going to old-time festivals, and attending square dances. The old-time bug bit her early in life and Rachel now performs and teaches full-time on fiddle, banjo, guitar, mandolin and bass. She has recently relocated back to West Virginia after living the last 5 years in Stockholm. During that time, she invigorated the Swedish old-time scene, inspiring dozens of people to learn Appalachian music and dance. In addition to being a performer, Rachel is passionate about teaching. 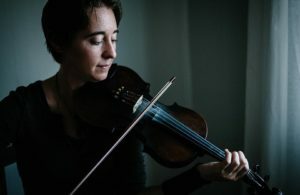 She has taught fiddle, banjo and guitar at the Augusta Heritage Center in Elkins WV, at Sore Fingers Summer school in the UK, and different various weekend workshops from the hills of West Virginia to Sweden, Denmark, Switzerland, Germany, London and Wales. Rachel’s love of music comes from the heart and she loves every part of her job from performing, to educating dedicated students, and the electrifying charge of playing in jam sessions around the world! A beloved tradition of the annual Winter Roots Roundup is the Women of Folkways concert, a celebration by women of women in the Folkways Records catalogue. This year we bring together Kaia Kater, Maria Dunn Music, and Dana Wylie. In a collaborative singer-in-the-round concert, these talented musicians will explore and celebrate the music of Folkways by presenting new interpretations of traditional folk songs, as well as their original songs to expand the tradition. This year’s concert is a co-presentation with the Northern Lights Folk Club. Time: Doors at 7:30 p.m.; Show at 8:00 p.m.
Winter Roots will also feature Sound Sessions outside of the concert setting, all of which explore some aspect of music’s essential role in shaping our world. Please join us for this rich variety of events highlighting the numerous and multifaceted ways that music enriches, enables, and empowers us as individuals, communities, and societies. Five hour-long sessions will be held 12pm-1pm, Feb. 4-8 in the Old Arts Building, University of Alberta, featuring a different artist each day: NASRA, Joe Nolan, Chris Wynters, Jeff Stuart, and Kaia Kater (free events, open to all; please note Kater’s Friday event starts at 11:30am).